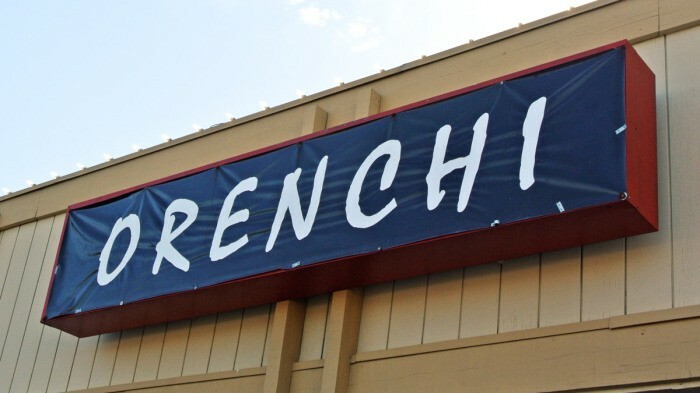 We showed up to this crappy little Silicon Valley strip mall in Santa Clara on a Tuesday at 11:30 AM on a lunchtime mission. Sure enough there was already a congregation of hungry and anxiously waiting patrons lined up out the door frothing at the mouth. 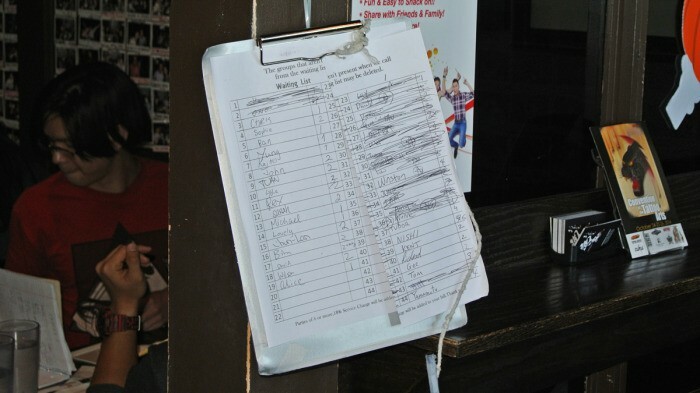 But, I pushed my way to the front of the waiting room and successfully added my name on the handwritten list for my group of four. Why would I endure this kind of brutality on my lunch break? 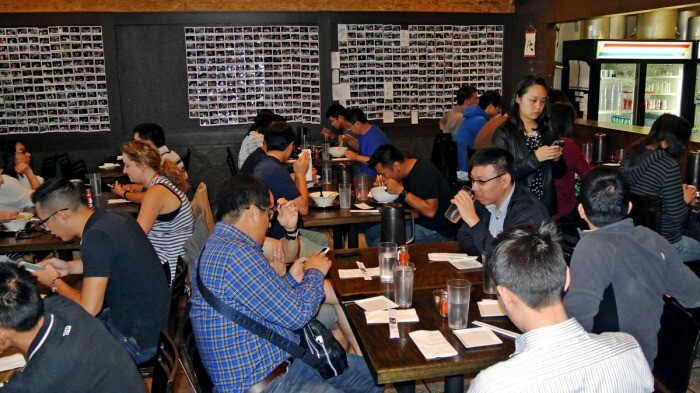 For ramen, of course – reputedly the best the Bay Area has to offer at that. Orenchi Ramen‘s reputation clearly preceded itself, but I was ready to experience it for myself. 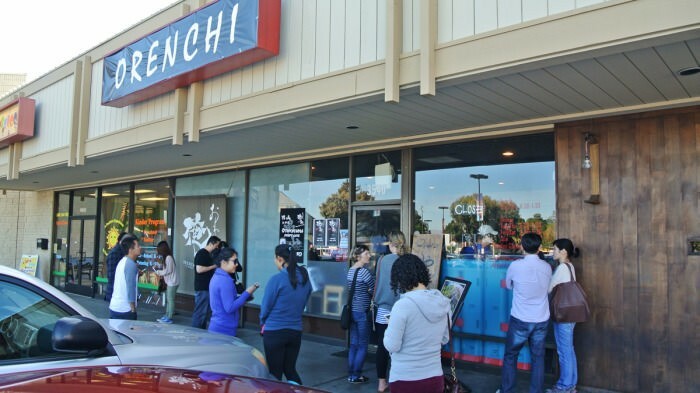 The level of hype surrounding this ramen joint is truly astounding and only grows stronger, threatening to feverishly bubble over, with the impending opening of their second location in San Francisco on Valencia. 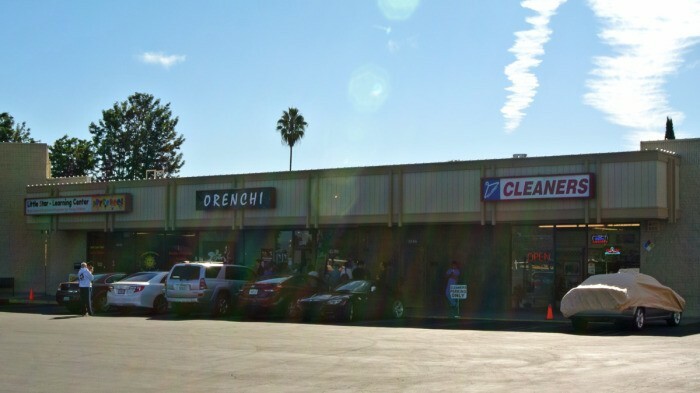 Just imagine the kinds of lines that hyper-trendy location will draw if this cruddy strip mall in Santa Clara is able to draw such impressively cultish hordes. As a table of four, we ended up waiting for a full hour – even with our 11:30 arrival – before my name was called and our table was ready. 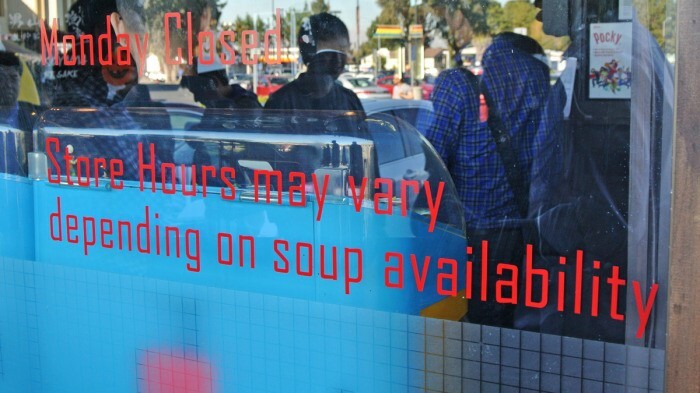 You’re gonna want to show up early because if you show up too late, they will literally run out of soup. This happens pretty much every day and can occur as early as 12:30 on crazier days. 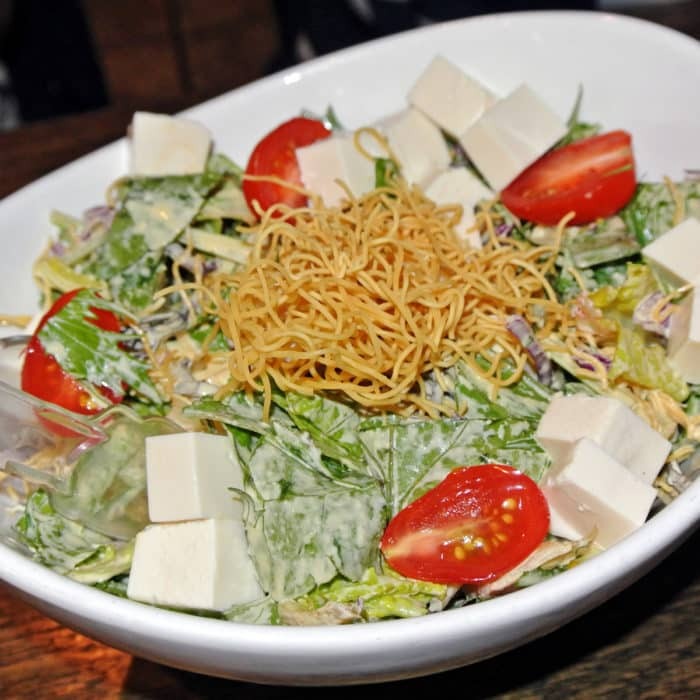 Since one of my four was a vegetarian, and a ramen joint such as this doesn’t exactly lend itself to their eating lifestyle, we ordered an Orenchi Salad for the table. I usually wouldn’t bother wasting any of my precious stomach space on something like this, especially with the amount of presumably incredible, hearty, epicness on the way but, I took a few bites anyways. This salad really was actually really awesome. The dressing tasted kind of like miso and buttermilk and it paired really well with the jiggly soft tofu cubes and crispy crunchy bits scattered throughout. Additionally, before getting to the main purpose for our visit, we began with a couple starters. 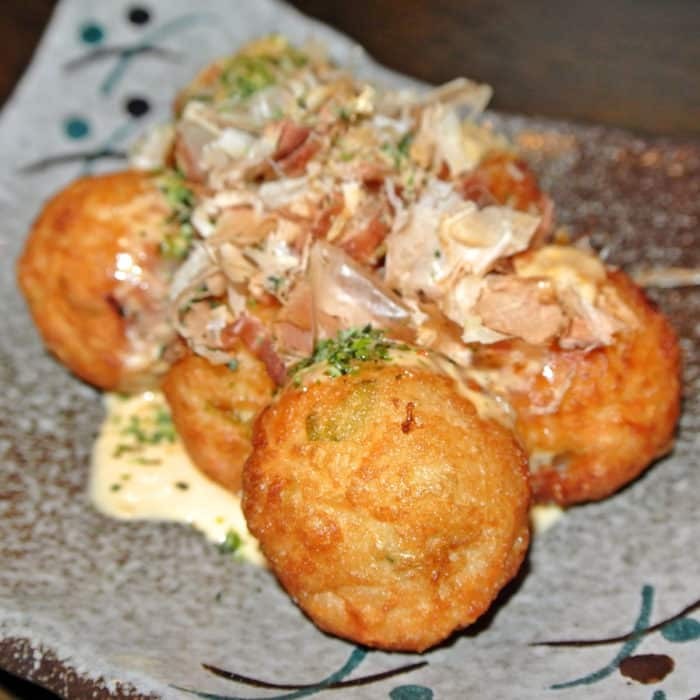 First, a Japanese comfort food favorite of mine – Age Takoyaki. These big fluffy, doughy spheres of luscious, savory, pancake-like batter engulfed large, tender octopus tentacle hunks inside of each one. They were dressed with a generous drizzle of creamy, spicy mayo sauce and a hefty handful of still wriggling shaved bonito flakes. The texture of balls were spot on – golden and crispy on the outside, doughy and nearly runny on the inside. They reminded me a lot of the fantastic ones from my beloved single-serving NYC takeout-only Takoyaki stall Otafuku, though these were actually way way better. 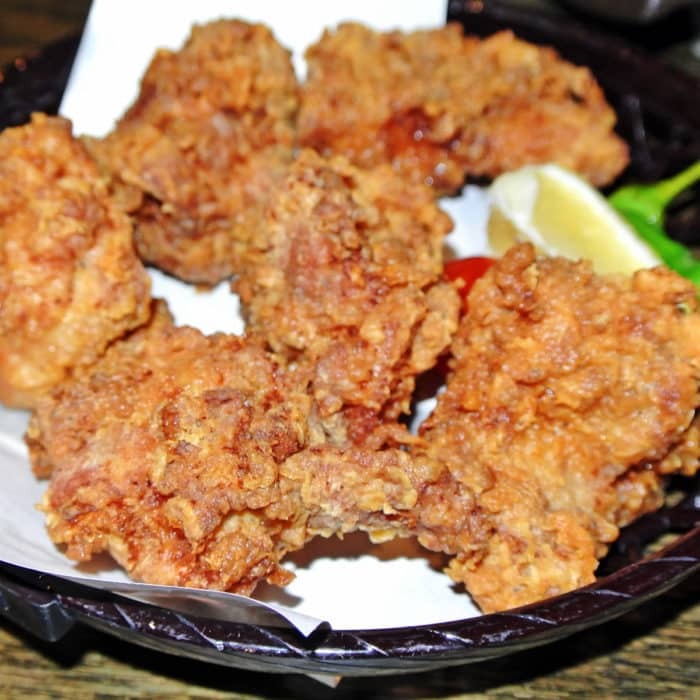 Our other starter, Karaage, was also incredibly impressive. Honestly, this was some of the best karaage I’ve ever had. Hell, it was some of the best fried chicken I’ve ever had. It was even better than the excellent stuff I’ve already raved about at the nearby Maru Ichi in Mountain View. The enormous boneless pieces of dark meat chicken were breaded, fried, and encapsulated in such a well-spiced, flavor-loaded crust. They didn’t need anything beyond a simple squeeze of lemon for any additional flavor. This dish consisted solely of excellent fried chicken and every piece shined completely on its own. But the real reason we came to Orenchi – of course – was for the ramen, specifically the Orenchi Ramen with Cha-Shu. As an experienced and highly opinionated New York ramen-eater, I’ve got pretty high standards. So I took all the hype with a grain of salt and entered this part of the meal cautiously. I’m here to say that this bowl of Tonkotsu Ramen was as good or better than any ramen I’ve had in the entire country. It was certainly the best I’ve had in the Bay Area. Literally every element of the soup was executed perfectly. First and foremost, the broth. It was super-thick, chunky, rich, and dense. The slow stewed pork bone broth was loaded with umami funk and had a black oil slick of mayu black garlic floating on the surface. Second, the noodles. 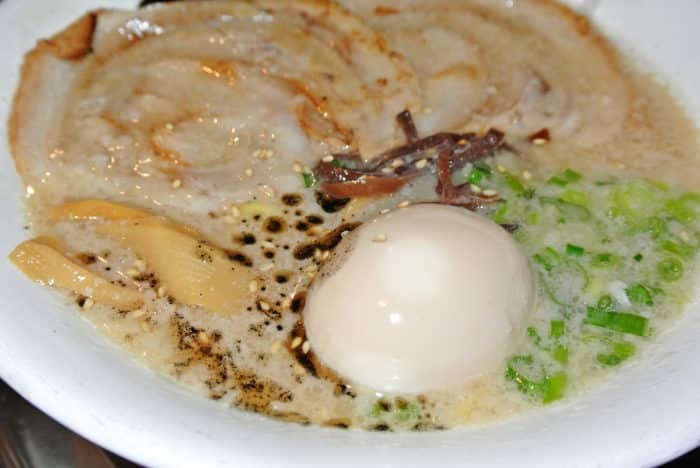 They were cooked to a precise al dente and were chewy, squiggly, and just perfect for picking up that extraordinary tonkotsu broth. The Cha-Shu (usually spelled char siu) was sliced super-thin, but somehow managed to avoid all of the usual trappings of poorly executed thin-sliced pork in ramen. It was not tough or dry like thin char siu often is. This was fatty, tender, and flavorful and shredded apart easily with a simple chop-stick tug. The seaweed was great as was the menma (bamboo shoots), but the whole, massive, perfectly soft-boiled egg with runny yolk truly sealed the deal for this incredible bowl of soup. The whole experience of it was just outstanding and it’s a truly killer deal at only around $10 for the bowl. The hype is real and so are the lines that come with it. Sure, I waited an entire hour for a bowl of soup and a few appetizers, but it’s actually worth the wait if you accept nothing less the best there is. Orenchi Ramen is the real deal. 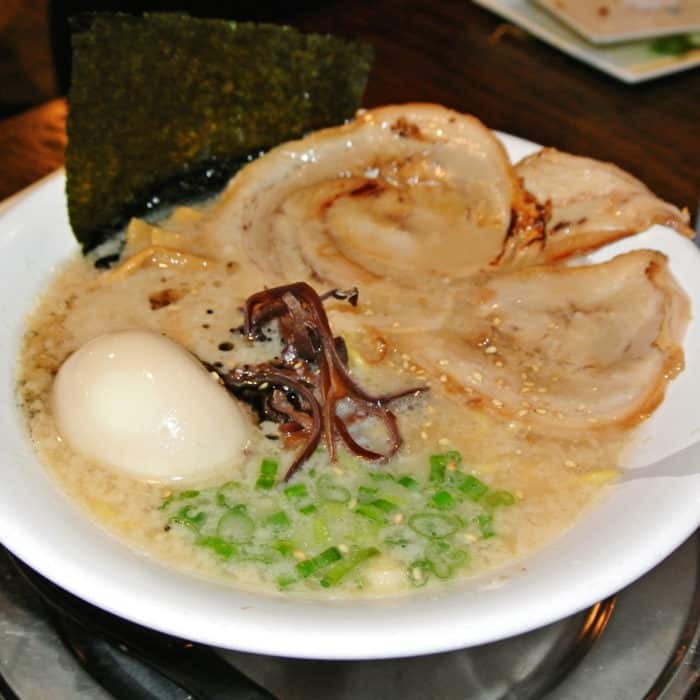 Got another outstanding ramen spot in the Bay Area that I need to try? Let me know in the comments below.